At 59 years young, William L. Madsen has been a bicycle enthusiast for 10 years averaging around 90 miles a week in and out of group and solo rides. Bill, as his friends refer to him, had no idea that he was even close to having a heart condition outside of some high cholesterol. One Wednesday evening group ride out of Ripon, from George’s Bike Shop, Bill suffered a major heart attack at mile 10. The last thing Bill remembers is that he was in the front of the group and then just fell over on his bike. The other cyclists immediately came to his side and Bill then told them that he was having chest pains, Bill then went into cardiac arrest. Thankfully Dr. Diaz was along for the ride that night and immediately started to administer CPR. He along with the other cyclists who also had similar background in medical emergency experience started to assist in trying to bring back Bill to life. Bill couldn’t have been in a better place outside of being in a hospital when his heart attack happened. On the doctors lead, he orchestrated some in the group in riding out to the various crossroads to direct the emergency vehicles to Bill’s location. After all, they were out in the country and if Bill might have been riding alone that day, well I shudder to think how Bill’s story would have ended. According to Bill, it was by the grace of God and not luck to have had so many caring fellow bicyclists riding with him that night including Dr. Diaz. MD., Jaime Cardosa, ER nurse, Steve Meece, Ripon Police officer, and Jared Cardoza, a Cardiac Technician. Today Bill is back on the bike carefully every day doing 20 to 25 miles out of Escalon to Riverbank and back. 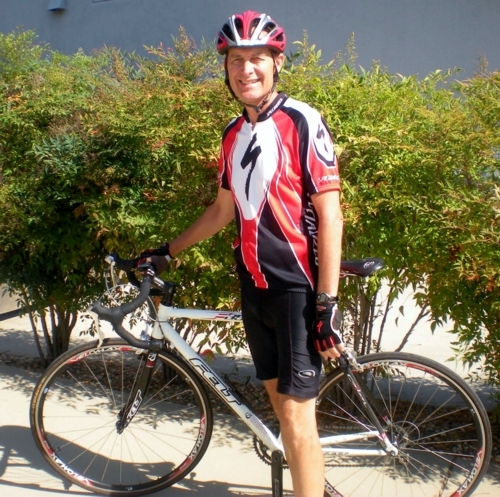 For Bill, biking is not only his preferred way to exercise, but he also enjoys being able to meet new people that share the same love for cycling as he does. Bill’s message to his fellow cyclists, Thank you, you saved my life and I’m eternally grateful, thank you for that and your continued support to keep me going.